We hit the 2019 running. Table Mountain holds nothing back. 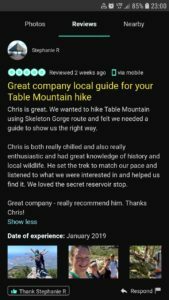 One adventurer Steph shared how she found the guided Table mountain trek on Tripadvisor as we are ranked #121. I find amazing pleasure in sharing my knowledge of the funa and flora on and around Table Mountain. With easy access to Table Mountain it is asronishpristine this majestic Mountain is kept and maintained. My appearance in The Lonely Planet makes all the difference and is a guide all should carry when traveling abroad. It is no secret that our packages come at an affordable rate that is carried out in a proffessional, safe and memorable manner. Book a guided hike up Table Mountain with us and experience Nature at its best.